September 2006, 7:30 in the morning. My interpreter and I meet at Ryogoku station. 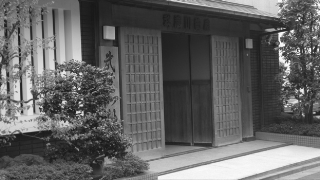 The appointment with Musashimaru oyakata had been arranged for 8 o'clock at Musashigawa beya. In the taxi, I recalled the origin of our meeting. Two months earlier, while exiting from the first day of the Nagoya tournament, I had passed a giant whose calmness seemed out of proportion to his build: Musashimaru. Two days later, I saw him seated high up in the seats, busily shaking hands and posing with the fans. I boldly approached him and entered into a conversation, in English, that lasted several minutes. The crowd moved on and Musashimaru invited me to come see a training session at his heya. In the weeks that followed, the suspense kept up conitnuously. I had to call, then make contact with the manager; wait, wait some more; accept, without batting an eye, the presence of an interpreter so that the questions would be understood by the manager; but finally, we were there. The taxi stops. Musashigawa beya is in front of us. Having arrived a little early, I take a short walk down the street to pass the time, pretending to relax, when I see a silhouette far away, approaching, calm and composed. I recognize him immediately as Musashimaru advances towards us. It takes several endless seconds. He sees me and recognizes me, nods his head and goes straight into the heya. First contact - so Japanese. A few minutes later, they come to get us. 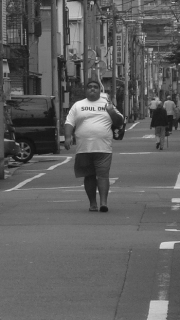 We sit down on the tatami mats for spectators, behind Musashimaru, whose t-shirt reads, in capital letters, "SOUL ON". It's those little details that one never forgets. During the entire training session nobody talks to us or even looks our way. It's perfect. Having the status of a ghost is completely suitable for the position of an observer. Musashimaru himself doesn't speak a word for close to an hour and a half. The oyakata, since that's his current title, watches, arms crossed, while the wrestlers sweat and strain on the clay of the dohyo. Buyuzan is there that day. I had never felt any particular attraction to this wrestler. Technically poor, lacking charisma, he is furthermore near the end of his career. But what I see this day makes me cheer for him from then on and every day of the tournament. Buyuzan, despite his low ranking, remains among the elite. All of the younger wrestlers seeking recognition know this. For almost one hour, the scene of the old lion facing the young lions plays out again and again before our eyes. During the pushing exercises, I see Buyuzan, with a strident cry each time, offering his body to the charges of the young wrestlers. These cries evoke all the aggression of the warrior refusing to be "put to death". The shout resonates and the young apprentice throws himself against the body of the older, making him cross the dohyo, feet sliding on the ground. Buyuzan's cry is truly gripping: the contrast between the imposing mass of the wrestler and the extreme shrillness of his shouts only serve to add a sense of surrealism to the scene. Buyuzan doesn't let up until he has exhausted all his energy - at least that is the impression I have when he leaves the dohyo, drenched in sweat. The intuition that I have often had regarding sumo is confirmed before my eyes. The dohyo unveils the essential - the essence of men, revealing them in battle. I keep my eyes fastened on Buyuzan until he disappears outside the training room. Then, Miyabiyama arrives. Sparing in his movements, almost static, he explodes suddenly from time to time in bursts of activity that never exceed ten or so seconds. The time passes slowly. I keep an eye on Musashimaru who doesn't say a word. He seems totally indifferent to this mix of flesh, sand, sweat and shouts. Finally, he gets up and makes his way towards an apprentice, showing him some details on grappling techniques. And there, we see the mass of the former yokozuna in action - slow, but completely unmovable. The apprentice tries hard to reproduce Musashimaru's movements, but doesn't budge him even one centimeter. After several minutes of straining, he is released by the master and sent back to the dressing room to meditate on his lesson. The manager signals to us, and we settle down. Yan Allegret: There's no problem if I record our conversation? YA: Ok we'll start in Japanese. First of all, thank you very much for inviting us here. Thank you for inviting me to Musashigawa beya after our first meeting in Nagoya (Musashimaru nods his head). On October 2nd, it will be two years since you retired. Mo: No, it's been three years. YA: According to my notes, it was October 2nd, 2004. YA: How do you look back on these three years? Mo: Oh, I'm doing many things. I'm traveling a lot. I'm organizing tournaments. I'm happy to be doing all that. YA: (Noticing the rhythm imposed on the conversation by having the interpreter intervening, I decide to continue the conversation in English). What's your best memory of your career? Mo: A match against Takanohana. It was in Fukuoka. We were both 12-2 and it was the last day. The tournament would be decided that day between him and me. I had almost lost. I was holding his mawashi with only one hand (laughs). But it was my lucky hand! I succeeded in pulling it off (Note: the bout, not the mawashi) even though I was in a difficult situation. What's more, a match between two yokozuna is something else. I was really happy to win that tournament. YA: I noticed something in your career, something incredible to me, which I'd like you to confirm: you were make-koshi only once in your entire career? YA: Just once! For the rest of your career, you had only kachi-koshi. Is that incredible, or what? And furthermore, this make-koshi was well before you entered the upper ranks! Mo: Yes it's true. In fact, I must have been 18- or 20-years old. 22, I think. And I broke my collar bone during that tournament. YA: Your one make-koshi was due to an injury? YA: Another important fact: for your first yusho, you went right ahead with a zensho yusho. YA: One can't say that you do things halfway. Mo: (laughs). Yes, indeed. And it's fairly hard to achieve a zensho yusho. YA: I imagine it must have been like a dream? Mo: No. It was simply winning the match each day. It wasn't a dream. Let's just say that I was in good shape. YA: Let's move on to something else. Takanohana, was he your favorite opponent? YA: Who was your favorite opponent and who was your toughest opponent? Mo: Takanohana was the toughest. I think, in fact, that I liked to go against him because he was really so hard to beat. YA: And others? Were there more opponents that you liked to go against? Mo: No. There wasn't a favorite. I was there to compete, so I was simply concentrated on each match. I didn't have any favorites. YA: You were ozeki for five years, in the shadows of two yokozuna, Takanohana and Akebono. You waited five years before becoming a yokozuna, yourself. Wasn't it a long wait for you? Mo: No. I was only 22 when I became ozeki. That's young. I hadn't reached my prime. So, I continued to train and, little by little, I mastered more techniques. YA: People have a hard time believing that an ozeki, who is so close to the top, must still learn. Mo: Yes but that's exactly how I lived those days. Like a time of apprenticeship. YA: And, finally, the day arrives when you become yokozuna. What memories do you have of the day when the Yokozuna Deliberation Council came to Musashigawa beya to tell you the news? Mo: Nervous. We had a press conference the night before. The date had already been set and that day, the television people were there. Everything was taped live, so yes, I was a bit nervous. YA: That day, was it a happy day or a stressful day? Mo: (He takes some time to think, then smiles.) A stressful day. YA: I'm associated with a French web site dedicated to sumo where lots of people admire you. Mo: Oh, really? (smiles) I was in Paris a while back. I'd like to go back there some day. YA: That would be fantastic. Mo: Yes, the exhibition in Paris was good. I had a friend who also took me around Paris at night. That was great. YA: If you come to Paris, come to my place and I'll make you something to eat. Mo: (laughs) Good. French food is good. Mo: Yes I like it a lot. We ate with President Chirac when we were in Paris. That was good. YA: As I mentioned, you have many fans in France. All these fans, and especially the members of the forum, info-sumo.net, gave me a message to pass on to you. YA: Yes. I brought the message with me. I'm going to read it, if that's okay with you. YA: "Congratulations on your brilliant career and for thrilling us, the French fans, during the 1990's and the beginning of the years 2000." Mo: Yes. You know, this is for the gods, to protect this area at night, and also to protect the wrestlers against injuries. YA: Yes, really. Speaking of the dohyo, what feelings go through you when you're on it? Mo: That depends if you're training or in a tournament. Mo: During training, it's all about repeating the movements. It's work and you have to get the techniques - learn them, repeat them. In the tournament, it's very different. You have to be completely intense about the match. You really concentrate. You don't focus on anything other than the match. It doesn't do any good to think, to reflect - that's the best way to lose. You have to concentrate on your opponent, on the match, on winning. It starts before getting up on the dohyo. It starts the minute you enter the "path of flowers". (Note: hanamichi, the pathway connecting the dressing rooms to the arena, which passes through the spectators. There are two of these, one on the East side and the other on the West. In the past, the spectators typically scattered flowers when the wrestlers passed in order to cheer them on, a practice that gave rise to the name for these pathways.) There, it's time to get to work. YA: During the tournament, there is a lot of noise, yelling and cheering. Some spectators don't even watch and just talk among themselves. Does all this bother you? Mo: It can be distracting if you're not focused. For me, I didn't hear any of all that. I didn't see anything. I only saw my opponent. YA: Could we say that in a certain sense, you have to enter the dohyo "empty", without any thoughts, in order to compete? Mo: In a certain sense, you could say that. Totally. YA: People also say that half the match is won before getting up on the dohyo. Mo: No. The match starts when the match starts. That's all. YA: Right. During the match is it technique or intuition that's more important? Mo: Winning is what's important. Technique and intuition help to get you there. YA: Do you think that losing is important to a wrestler's career? Mo: (His face darkens. He thinks for a while.) Losing, it happens, for sure. But by losing you go down in the ranks, and that, you can't do. So I think winning is more important. But not just winning. You can't be happy with 8-7. You have to go further. Aim for 10, 11 wins, minimum. YA: One shouldn't be happy with just kachi-koshi? Mo: No. You have to aim higher. Always. YA: I also think that your career explains your answer. You had only one make-koshi. I think that you forged yourself in victory and not in defeat, like Kirishima was able to do, for example. Mo: Yes, it's true, you're right. (Someone from the heya comes to tell him something.) Listen, I'm going to have to go. Are you going to the tournament? YA: Yes, in a bit. Mo: When are you going back? 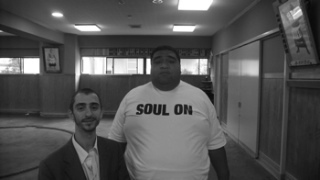 Mo: Come by the Kokugikan on Sunday, we will talk some more. YA: Ok, I'll be there. It's really nice here. I found the training really great. YA: Yes, there's a quality of silence, an intensity that's very impressive. I didn't feel this elsewhere. 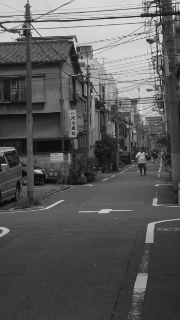 I went to Michinoku beya and to Takasago beya, but I didn't find this quality of silence there. There is something special here. As soon as we entered, I felt this force of concentration. Mo: Force of concentration - yes that's right. You felt that here? YA: Yes, much more here than elsewhere. (Musashimaru smiles, visibly surprised that I was able to feel this). You know, I work in the theater. And in the theater, we always start from silence. I'm therefore particularly sensitive to it. YA: Thank you very much for granting us this time. Can we take a quick photo to finish up? (My interpreter takes a picture, I show it to Musashimaru. Clearly he doesn't like it. He has it redone twice. But he's right. The last photo is superb. Then I take a picture of my interpreter with him.) A forecast for the basho? Mo: No, it's too early. Wait three or four days. YA: At the Nagoya tournament, the yokozuna was good. Mo: Yes, at Nagoya, yes. But here I find him a bit soft. The ozekis, too. Roho is getting on well. Well, it's too early to predict. YA: Okay then, see you Sunday? We leave Musashimaru and Musashigawa beya. In the end, the interview on Sunday didn't happen, Musashimaru being, as oyakata and ex-yokozuna, in high demand and very quickly out of reach. Nevertheless, the half-hour spent with him was really extraordinary, as much for the legend he represents as for the extreme simplicity of the man, himself. It's perhaps this contradiction, added to the ambience - the ki, one would say in Japanese - that permeated the heya, that comes back to me six months later. When we leave, morning in Tokyo is slowly stretching out. Ten in the morning, and we are walking the streets, frantic and smiling like fools, looking for a taxi. Once seated in the taxi, I take my recorder and realize, with a burst of laughter, that I had not plugged it in: that's how much the imposing presence of Musashimaru had distracted me. I had therefore forgotten to press "play" and I now have to re-transcribe everything from memory immediately, at the risk of losing certain details, certain phrases and possibly the entire conversation. I leave my interpreter at Ryogoku station, buy a ticket for the tournament and enter the Kokugikan. And during the hours where the lower divisions battle it out down below, each wrestler hoping secretly to rise to the summit, I write, without pausing, the words and exchanges with the yokozuna.